Notice how I didn't write anything before I put up the pictures of the first and only carp I caught today? That's because I caught it right away in the first spot on a long multi spot trip. Rik and I tried to catch more, there's no doubt about that, and we both had some maybe-that-was-a-take moments, but no more carp. We discussed this o the way home... catch one good fish right out the gate and the trip will turn out one of two ways: either it will be a huge bonanza or a slow disappointment. Now that isn't to say we didn't get shots... we got lots of them. But abnormally muddy water (it is always muddy around here but this was BAD) and super picky fish in the one place with both clean water and carp put us at a disadvantage. After a lot of time on the water, seeing lots of carp, and getting missed opportunity after missed opportunity, we found a new pond and a whole pile of fish! First I caught a nice largemouth of about a pound on a mop fly. Then came a whole pile of little bluegills on a dry dropper, a pair of goldies, a little crappie, and even a hybrid. That was the best way we could have ended the day without a bunch of carp. I could catch any fish in the world and the old standby's will always have a place in my heart. Sunfish and shiners are pretty, willing, and fun. Though it looks like one last cold slap is in bound, some more and bigger carp are not far away. 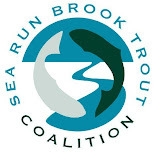 And the spring runs are already in progress in some areas with alewives being spotted in RI and on the Cape. 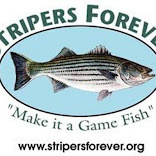 Soon, soon the big stripers will come. And shad by the millions, and maybe if are lucky a handful of salmon. I love spring. All I could think looking around was "this isn't going to go too well". But I could see some fish moving around so I made a few casts with McTage's Trouser Worm... and I caught a beautifully colored and decent sized largemouth! And that was the only fish of the day, but really all I needed. Fun little outing. Tomorrow, I'm chasing carp, some ponds that have a pile of commons and one that I recently learned has a hanful of absolutely massive grass carp. Fingers crossed I'll get a 50-60 lb grasser. The more I fish it the more I'm realizing my PTHW is exactly what look for in am excellent small river for streamer fishing: healthy macro invertebrate population leaning in favor of small insects like midges, mediocre water clarity most of the time, some but not many crayfish, a healthy run of suckers, strong fallfish and shiner populations and a run of spot tail shiners, and a low fish count but a very good average size for a river its size. Oh yeah, and sculpins all over the place! It really is tailor made for big flies that imitate bait fish. That doesn't make it easy, it is still pressured marginal water with bad summertime temperatures and flows, but holds wild fish so I really don't care. And I know there are some giants in there. I just need to find them. Today I didn't find any monsters but I did put my time in and after a very long time with no signs of interest of any kind I finally got an eat. But lets not get ahead of ourselves, catching is not the only thing of worth to come out of a good day on the water. Before I had even gotten to the river I had seen deer, osprey, and three species of hawk. As I was rigging up my rod I noticed a wood turtle in a tricky spot. It had climbed up quite a steep clay bank and the slide marks suggested it was having a hard time finishing the job. I gave it a helping hand. So, back to the fishing. After a while without any interest, no fish spotted, and seeing a couple other anglers who were also skunking, I had pretty much lost confidence. Then my tan, yellow and orange Maraceiver got absolutely pummeled. I laid into the fish with everything I had and got the hook buried firmly in the bottom lip. The ensuing battle mademe think I had nailed a 20, but when I got it to hand it was just another mid teens wild brown... this place is spoiling me. Every fish I've caught here has looked wildly different, running the gamete of different strains and sub strains we have here. This one is a color variant I have been trying to get in the Farmington for a while now... dark brown body with blue on the cheeks and big dark spots that are very round and well spaced, very similar to wild trout from the chalk streams in England. If you have seen the fish from this famous river you will notice that they are very often without red spots or only have dark ones on the caudal peduncle, as was the case with this beautiful specimen. Further upstream I was working my fly along a pile of woody debris when it was eaten by a pint size critter. Props to that little wild dude for eating a fly as big as him but I wanted something bigger. After covering lots more water and missing two good trout eats I got something bigger but it wasn't exactly the right species. A little unexpected but remember, Kirk caught a couple of these when we fished this river. It was good way to end my fishing as the wind was kicking up and I had to make tracks. A day of streamer fishing like this, at this time of year, can not be taken for granted. From day's back it was clear that today was going to be a gorgeous February day. Warm, clear, not too windy. It would be a sin not to fish on such a day. Rik and I had talked about it a bit in the days leading up but the ideas did not include the Farmington until last night. I'm glad he brought it up, today was a great day to be up there. When we got up to the Riverton and saw the parking at Hitchcock was completely empty we both uttered the same sentiment. This not so secret spot has been the best game in town for rising trout for weeks if not months and yet here it was, devoid of anglers. Our early leave time payed off, but when a well known local guide got in at the head of the pool started putting us to shame I can't say I didn't get just a tiny bit jealous! But with slight modifications to both of our rigs Rik and I were both soon into fish. My first brownie took a size 18 perdigon fished like a wet fly. I could have kept going with my two fly lite rig but I didn't really feel like it since there were quite a lot of fish rising sporadically I decided to re-tie with a dry dropper. The dry was a size 12 Puterbaugh caddis. More of an indicator than anything else. The dropper was the same perdigon I'd had on before. Guess what fly got eaten first? The dry. After messing around with that rig for a while without any hookups and a few more takes on the dry I changed to a single fly, a size 10 yellow stimulator. Around that time a couple guys walked up on the bridge and were talking about what the fish were doing. They both repeated the same thing a bunch of times. "Yup. Eatin' something VERY small". The some-teen inch fat brown I caught a minute or two later would beg to differ. And that was not the end of the dry fly action, oh no. In a good stretch of flats there was a handful of fish rising on the far bank. I went to a more subdued fly, a black Sedgehammer Caddis, and with a good presentation another solid brown sucked it down. Next up was a nice healthy bow. It gave the glass rod a really good workout with several strong runs. It looked like a little steelehead, all bright and muscular. After that fun, we headed towards the stream that was originally in our plans. It's one I'd been meaning to fish for a while. Upon arriving I was immediately happy to see lots of clean water and some sizable brook trout in a slow pool. The Picket Finn, a Fran Betters pattern, took a couple beautiful brookies to end the outing. This short scouting to a new stream capped of a tremendously fun day of fishing. Big dries on the Farmington, nice brookies in a new stream. Is it really February? The last two day's I've fished were just a royal mess of places and species and flies and all sorts of other things. Yesterday I fished one body of water, the stream feeding into the Bell Pond. I was looking for perch and I found them. I also found some substantial bass, but along with all of the larger perch that were there they were onto onto me quickly. Small yellows were all I caught, jigging small euro nymphs with hot orange tags. But it was good to confirm my hunch that they would run up this stream in the winter. Today was a REAL mess. I was all over the place. I started out on a stream that I hadn't fished in two years. It had a few brookies then, and as I had seen it in the fall and it had some water I figured it still did. I didn't catch any though so who knows. Then it was on to the tidal river I'm focused on figuring out this spring in search of perch and sea run browns. No luck s I went to look for some pike. So needless to say, no pike, so I went to check out a little stream that I've been eyeing for a while now. On a foam ant I caught exactly one little brook trout. It was a spunky one and threw the barbless hook before I got to my camera. I fished up and down that stream and could not find another one. Odd. Ah well, that's another stream on the list. Then more sea run brown trout fishing. Nobody home. I'm sure these are all spring and fall spots as far as they are from actual salt, but if you don't start early you'll never know. And then I went to a pond and caught some bluegills. They were sitting in the sun baked shallow flats. One on a dry, on on a kebari wet. The first of the year. "The Well Rounded Fly Angler"